Provide Diploma Engineers to the society and industries at the national and international level through excellence in the field of Production Engineering. To ensure continuous curriculum development on par with the ever changing technologies. To maintain the state-of-the-art infrastructure towards education and motivate the faculty through continuous learning. To build and maintain the academic skill sets of students to make them globally competent. To offer career guidance to students by industry and academic experts for enhancing skills towards employability and higher education. 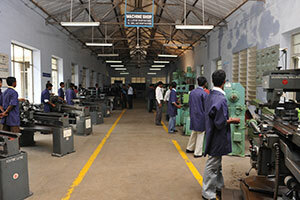 To establish incubation centre for industry projects, internships and develop entrepreneurs. Diploma graduates will hold responsible positions in manufacturing industries or will complete their graduation in Production and allied engineering disciplines. Diploma graduates will contribute their services to the society as an entrepreneur. Diploma graduates will exhibit values and ethics in their career through life-long learning. Apply their knowledge in the domain of machine tools and its operation and design of cutting tools to solve engineering problems utilizing latest technology concepts. Manage to work in the domain of various metal forming techniques to simplify the production process cycle to minimize the manpower, machine, material and cost. The Production Engineering Programme was started in 1982 and the programme is accredited by the National Board of Accreditation, New Delhi. Strength of Materials, Manufacturing Processes, Engineering Metallurgy, Design of Machine Elements, Electrical Drives & Control, Fluid Mechanics & Fluid Power, Thermodynamics & Automobile Technology, Special Machines, Engineering Metrology, Tool Design, Industrial Engineering & Management. Machine Drawing & CAD Practical, Foundry & Welding Practical, Lathe & Drilling Practical, Life and Employability Skill Practical, Strength of Materials & Fluid Mechanics Practical, Thermodynamics & Automobile Technology Practical, Machine Tool Maintenance & Metallography Practical, Special Machines Practical, Professional Practice & Mini Project, Computer Aided Design and Manufacturing Practical, Process Automation Practical.